Part XII: 1894-1902 features contributions from C.H. Dye, David Marcum, Thomas Fortenberry, Daniel D. Victor, Nik Morton, Craig Janacek, S. Subramanian, Jim French, Robert Stapleton, Nick Cardillo, Paul D. Gilbert, Mike Hogan, Derrick Belanger, John Linwood Grant, Mark Mower, Jane Rubino, and Arthur Hall, and a poem by "Anon." 34 new traditional Holmes adventures in two simultaneously published volumes "Somewhere in the vaults of the bank of Cox and Co., at Charing Cross, there is a travel-worn and battered tin dispatch box with my name, John H. Watson, M.D., Late Indian Army, painted upon the lid. It is crammed with papers, nearly all of which are records of cases to illustrate the curious problems which Mr. Sherlock Holmes had at various times to examine..." - Dr. John H. Watson So wrote Dr. Watson in "The Problem of Thor Bridge" - and ever since, Sherlockians have been bringing us new adventures from this legendary tin dispatch box. While his original Literary Agent only edited the pitifully few sixty stories that make up the original Canon, there have since been literally thousands of traditional adventures about the true Sherlock Holmes - and there will never be enough! Throughout the original Holmes Canon, there were hints and teases of other intriguing cases - The Giant Rat of Sumatra... The Abernetty Tragedy... The Manor House Case. Watson mentions well over one-hundred of these, which have collectively come to be known as The Untold Cases. 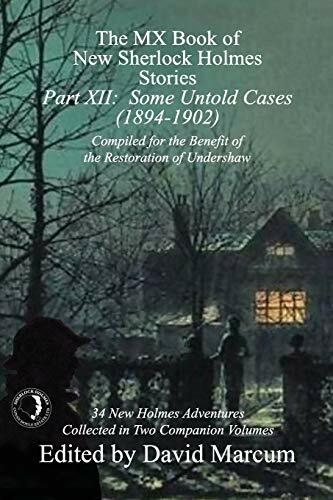 Now, the latest MX anthologies present thirty-four of those adventures in two simultaneously published volumes, with all royalties going to support the Stepping Stones School at Undershaw, one of Sir Arthur Conan Doyle’s former homes. Join us as we return to Baker Street and discover more authentic adventures of Sherlock Holmes, described by the estimable Dr. Watson as "the best and wisest... whom I have ever known." Each volume contains forwards by Lyndsay Faye, Roger Johnson, Melissa Grigsby, Steve Emecz, and David Marcum.